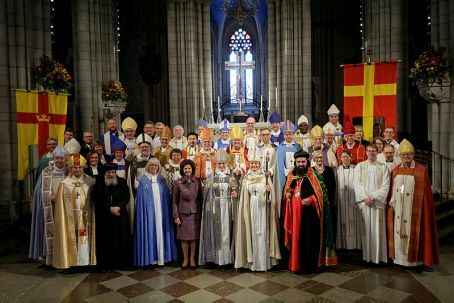 On Sunday, 3rd March 2019, Karin Johannesson was consecrated bishop of the Diocese of Uppsala in the Cathedral of Uppsala. Church Communion between the Utrecht Union and the Church of Sweden was agreed two years ago. In view of this, I was invited to participate at the event in my capacity as secretary of the International Old Catholic Bishops' Conference; an excellent opportunity to experience and strengthen the Communion. On Saturday, before the rehearsal in the cathedral and the reception in the archbishop's house, the numerous guests enjoyed a lecture with discussions. The theme looked at questions of how we give religious education today, and how we are to educate children and young people in the Christian faith today. The speaker was Tron Fagermoen from the Church of Norway. After the impressive consecration service, attended by HM Queen Silvia, there was yet another reception in the archbishop's house. The ambassadors of the countries whose bishops took part in the service were also invited to the consecration and reception. I was very pleased to have the chance to talk with the Swiss Ambassador Christian Schönenberger and his wife.